The Mixing System: The concrete batching plant use JS1000 twin horizontal shaft compulsory mixer with high capacity but less time. Twin motors and reducers design for double power supply. Batching System: PLD1600 batching machine, the batching aggregates can be 3-5types, 6m³ basic storage bins volume，1600L weighing bins volume，7.5kw motor, belt width is 800mm. Feeding System: Feeding is of closed belt type by continuous feeding, the belt is of china famous brand and the idler is troughed type, with belt tension system and cleaning system. Wait hopper volume is 2m³. Screw convey: Diameter ø219mm, reducer power 11kw. Cement silo:60ton – 200ton, Split for shipping conveniently. 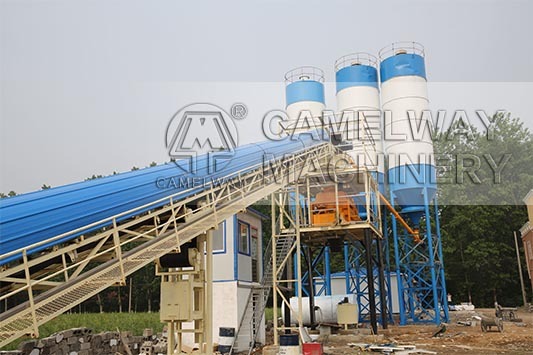 If you want to know more information about the concrete batching plant or buy it, you can leave a message, we will give you reply as soon as possible.